This interactive presentation contains the latest oil & gas production data from all 22,067 horizontal wells in the Eagle Ford region, that started producing since 2008, through December. December oil production, close to 1.3 million bo/d, barely changed y-o-y. Just over 1,800 new horizontal wells were able to counter the ~45% decline in legacy production in 2018. Gas production hovered last year just below 6 Bcf/d. 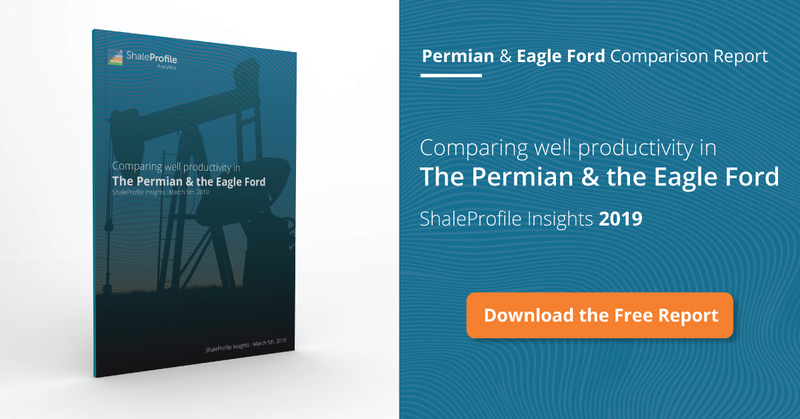 Initial well performance in the 2 main formations (Eagle Ford & Austin Chalk) was basically unchanged in 2018, as the bottom graph in ‘Well quality’ tab reveals. The over 3,500 horizontal wells that started since 2017 are on a path to recover 150 thousand barrels of oil in the first 2 years on production, on average, in addition to about 0.7 Bcf of natural gas. The leading operator in this basin, EOG, has been increasing output throughout 2018, and exited the year at twice the rate than the number 2, ConocoPhillips (see “Top operators”). In this “Ultimate Recovery” overview, the relationship between production rates and cumulative production is revealed. Wells are grouped by the quarter in which production started. You can see here that the bulk of the wells that began production since 2011 are going to recover on average between 150 and 200 thousand barrels of oil, before hitting a production rate of 10 bo/d. This does however also include a significant number of gas wells. Filtering on well type (oil/gas) is a subscriber-only feature. The 4th tab ranks operators by the average cumulative oil production in the first 2 years. Of the larger operators (>100 operated horizontal wells), Devon, ConocoPhillips and Encana are showing the best results according to this metric. If you missed our briefing on all the major tight oil basins on enelyst last Tuesday, you can still read the full update by entering our channel here: ShaleProfile channel on enelyst. Registering is free: enelyst registration page. Early next week we will have a post on all the 11 states that we publicly cover in the US (Oklahoma is currently for subscribers only). Production data is subject to revisions, especially for the last few months. Texas RRC. Production data is provided on lease level. Individual well production data is estimated from a range of data sources, including regular well tests, and pending lease reports. By clicking on the legend you can highlight the related data. Start the conversation. Be the first to place a comment.